Day 40!! What an amazing journey through various Scriptures that capture God’s heart for his creation! Jesus began the ministry of reconciliation that reverses the effects of sin, and he calls his followers to extend this ministry. 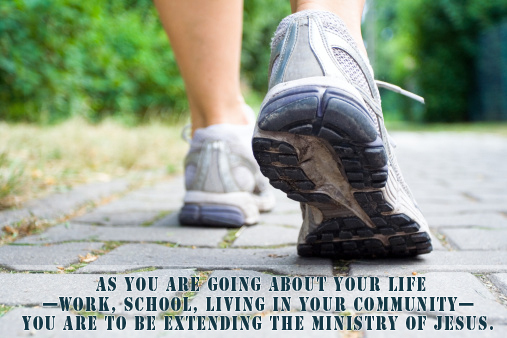 extending the ministry of Jesus. This has implications for all followers of Jesus. As we live out our faith, we implement the priorities that Jesus taught, and we teach others to do the same. To carry out this commission faithfully, we must demonstrate and declare a Gospel that has implications in all areas of our lives. If we put into practice all that Jesus taught, we will begin to experience communities of SHALOM—holistic wellbeing with security and equity in all areas of life: economic, political, social, and spiritual. This is God’s intention for the world; he longs for all people and all nations to experience healing and wholeness in relationship with him, with others, and with all of creation. As we enter people’s lives, sharing the message of Christ and demonstrating kingdom values, we will see a broken, sinful world restored, renewed, and transformed. The most exciting part of this journey is that Jesus promises to be with us always. While he commissions us to carry on his work by his Spirit, he is present—sustaining us, strengthening us, empowering us, and guiding us. 1. What does Matthew 28:16-20 say about justice and compassion? 2. In what areas of life can I share the message of Christ “while I am going”?